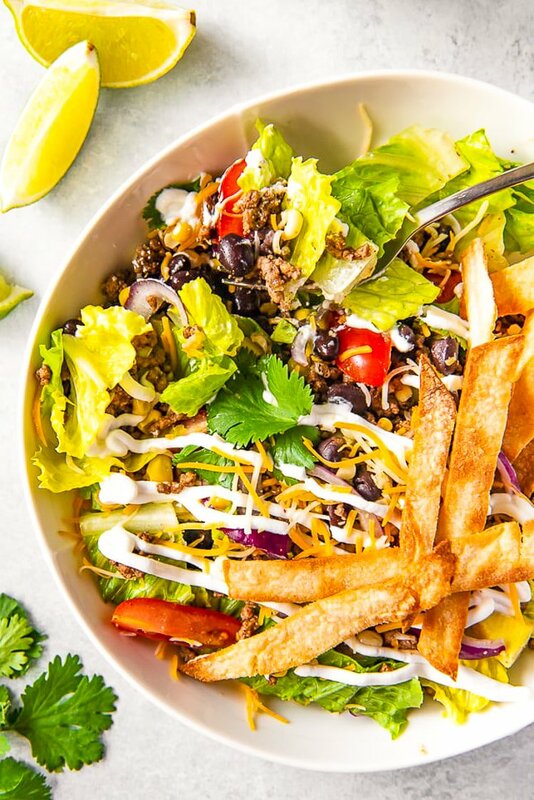 Taco Salad is the easiest way to rock Taco Tuesday like a pro! It’s loaded with fresh veggies, cheese, and seasoned meat with crunchy tortilla strips! Whether you’re meal-prepping or looking for a quick weekday dinner, this recipe is a real crowd pleaser. 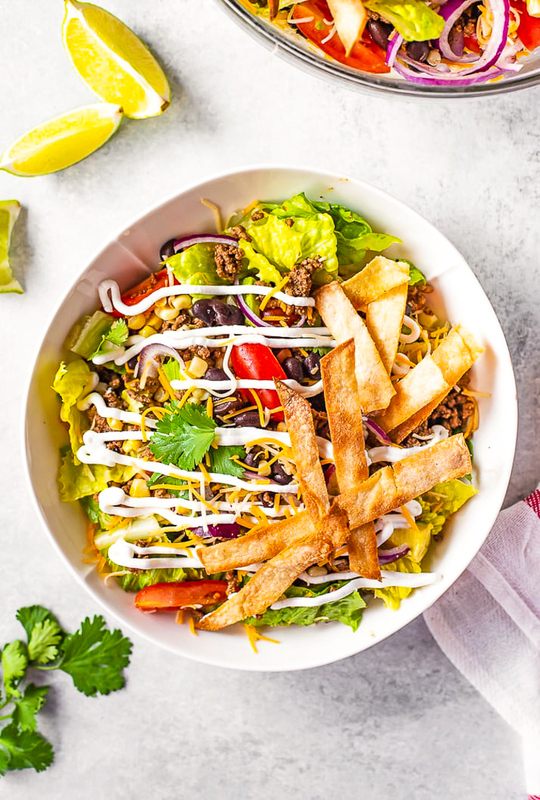 There’s nothing quite like sitting down with your family around a spread of taco fixings, but for those nights when something quicker is necessary, we turn to the trusty Taco Salad. Taco Tuesday has become an institution in 21st century America! Much like Pizza Fridays and Meatloaf Sundays (or whatever your Mama made for sit-down dinners), tacos have weaseled their way into our collective hungry heart calendar. The same flavors in your favorite handheld meal but with less mess? 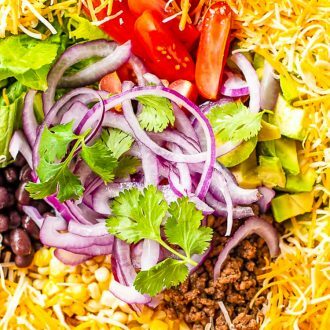 This fully loaded Taco Salad is a weeknight winner – and it’s completely versatile and adaptable to whatever is in your fridge. JUST TAKE ME TO THE TACO SALAD RECIPE ALREADY! 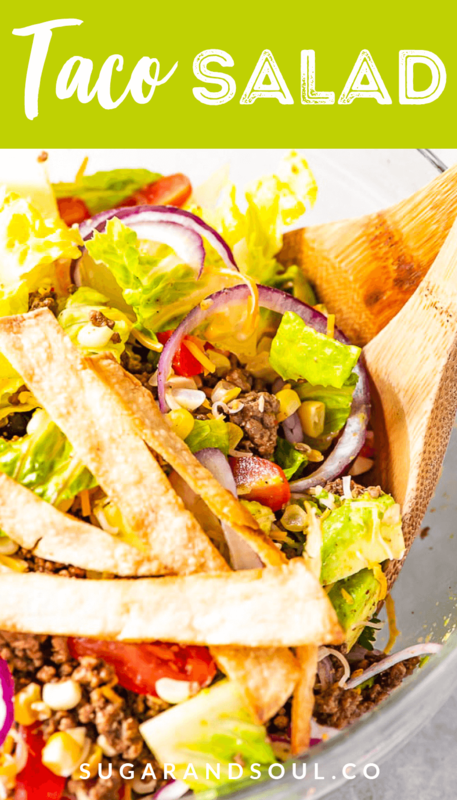 If you’d rather skip my (very helpful, I think) tips and tricks, essential cooking info, and similar recipe ideas – and get straight to this deliciously easy Taco Salad Recipe – simply scroll to the bottom of the page where you can find the printable recipe card. Taco salads are one of those quick dinners that can be enjoyed all year long, for any meal, and in pretty much no time at all. After a long day at work, choosing to throw together a quick, filling, and healthy salad like this one is a much better option than takeout! You start with standard salad ingredients – lettuce, tomato, onion, cheese. Your options are endless, between romaine and iceberg, red onion or sweet. Use what’s in your fridge and pantry – don’t feel like you need to make a special trip to the store. Next comes the taco toppings, in the form of corn, black beans, avocado, and cilantro. 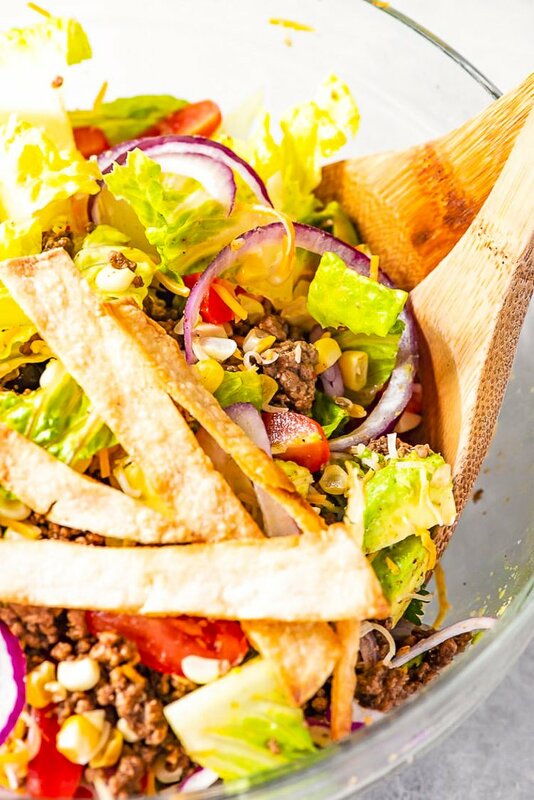 Since we’re skipping taco shells, tortilla strips bring that crunch factor to the salad that makes it irresistible. And of course, don’t forget the protein! I used ground beef, seasoned with all those tasty Mexican flavors, but you can switch it up! If you prefer ground pork or chicken, use them instead! This salad can be as healthy as you want it to be. Texture, texture, texture. Tacos often have a crunch to them, and the tortilla strips in this recipe hold true to that. Both corn and flour tortillas work for them (depending on your tastes), but you can also use store-bought strips or even flavored corn chips in a pinch. Crumbled or Shredded? Ground meat in taco salads is fantastic, but if you have leftover shredded chicken or beef from another dinner, you can throw that in here instead! Mexican Flavors! If you have packets of taco seasoning, feel free to use them over the ratios in the recipe. They’re essentially the same, and you won’t have to buy any special seasonings if you don’t already have them. Dress It Up. Whether you drizzle your salad with sour cream, Greek yogurt, or Catalina from the bottle, give this meal its fair share of liquid to make it shine. No one likes a dry salad! 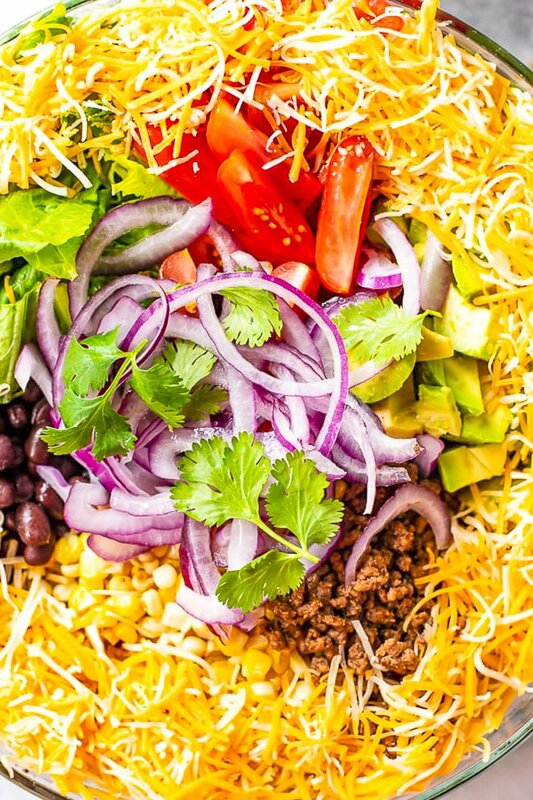 Pin this Taco Salad Recipe for Later! 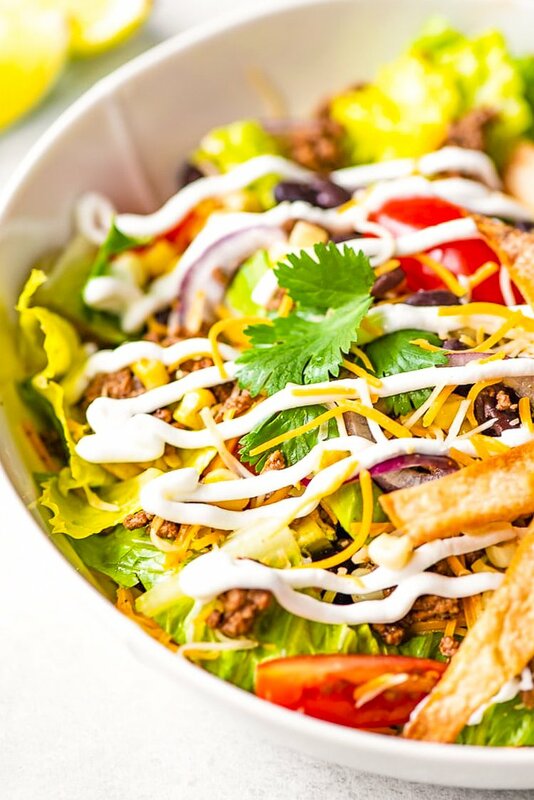 Taco Salad is the easiest way to rock Taco Tuesday like a pro! It's loaded with fresh veggies, cheese, and seasoned meat with crunchy tortilla strips! Whether you're meal-prepping or looking for a quick weekday dinner, this recipe is a real crowd pleaser. Preheat oven to 425 degrees F. Line a baking sheet with parchment paper and spray it well with cooking spray. Set aside. Cut tortillas in half, and cut each half into 6-8 strips (depending on how wide you want them). Arrange them on the prepared baking sheet. Spray or brush the strips evenly with canola oil. Sprinkle the salt over the strips. Bake in preheated oven for 4-6 minutes or until browned, rotating baking sheet halfway through cooking time. In a large skillet set over medium-high heat, brown meat. Drain off fat through a colander and return beef to skillet. Return the skillet to the stovetop. Season the meat with the cumin, chili powder, garlic powder, salt, and pepper. Add the water and bring to a simmer. Reduce heat to low, cover, and simmer for 10 minutes. Place all salad ingredients in a large bowl. Toss together well and serve with lime and sour cream. This recipe can also be made using ground pork, ground chicken, or ground turkey. This really is the ultimate taco salad! SO good and perfect for taco night on these hot summer days! Taco salad has dropped off my radar lately – so glad to be reminded of this salad. Wonderful tips for too for working with what you’ve got on hand!! !